PGSCA is proud to present the 35th annual Cinco de Mayo Fiesta at Portland's Tom McCall Waterfront Park on May 3rd, 4th & 5th! This is our most important fundraiser, which allows us to fulfill our mission through ongoing cultural, educational, and economic development initiatives. Back again! Come onboard the Portland Spirit as we are joined on two different decks by DJ Blas and DJ CJ, spinning the hits, bachata, reggaeton, salsa, merengue, rock en español and more! Visit the bar and sample delicious cocktails while cruising down the Willamette River as you dance the night away! PGSCA is proud to present the 34th annual Cinco de Mayo Fiesta at Portland's Tom McCall Waterfront Park on May 4th, 5th, and 6th! This is our most important fundraiser, which allows us to fulfill our mission through ongoing cultural, educational, and economic development initiatives. Come onboard the Portland Spirit as we are joined on two different decks by DJ Blas and DJ CJ, spinning the hits, bachata, reggaeton, salsa, merengue, rock en español and more! Visit the full bar and sample delicious cocktails while cruising down the Willamette River as you dance the night away! ** online pre-sale has ended, but we will be selling tickets at the dock, beginning at 10:00 p.m. The address is the Salmon Street Fountain 1000 SW Naito Pkwy, Portland, OR 97204. Come onboard the Portland Spirit as we are joined on two different decks by DJ Blas and DJ CJ, spinning the hits, bachata, reggaeton, salsa, merengue, rock en español and more! Visit the full bar and sample some amazing cocktails while cruising down the Willamette River as you dance the night away! Boarding begins at 10:30 p.m. The boat sets sail at 11:00 p.m. and returns to dock at 1:00am. Don't forget your dancing shoes! All proceeds go to support the activities of Portland Guadalajara Sister City Association. For more information, click here. On Friday, April 8th, come dance the night away with Melao de Cuba, bringing their live Latin rhythms to the beautiful Willamette River, incredible cocktails, DJ Blas spinning the hits, and a dance floor that is sure to be hopping! Join us for PGSCA's 31st annual Cinco de Mayo Fiesta at Portland's Tom McCall Waterfront Park. Our Fiesta celebrates the richness and diversity of family, culture and community with authentic Latino art, music, dance performances, cuisine, and handmade crafts by artistans flying in from Jalisco. Portland's Cinco de Mayo celebration is the largest multicultural festival in Oregon and is consistently rated in the top 5 Cinco de Mayo celebrations in the nation. 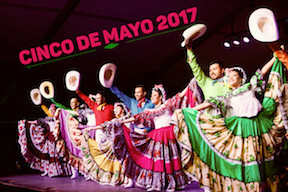 Join us for the three day Fiesta Saturday May 3rd through Monday May 5th at Tom McCall Waterfront Park, where we will be bringing folkloric dance, music and color to the city of Portland and its residents for the 30th year in a row! For more information, visit the Cinco de Mayo website. Tickets $15. All proceeds will go to the PGSCA education fund.